If you click on the title/name of a Risk/Issue from anywhere in WeTrack, you will be taken to the Risk/Issue Details Page for that item. This page provides full information about the Risk/Issue and any Action Steps necessary to deal with, mitigate or close the Risk/Issue, and this article explains the different parts of the page. The top of the Risk/Issue Details Page contains the Risk/Issue Title and an option to edit the Risk/Issue, if you have permission. Below the Risk/Issue Title sits the context, showing the Project and Department(s) to which the Risk/Issue has been assigned, and the names of each of these are clickable links which will take you through to other parts of the system relevant to that context, such as a list of Risks/Issues filtered to either the Project or the Department you have clicked on. To the right of this box sits Impact and Likelihood scores for the Risk/Issue. The Impact is measured on a 5 point scale (as indicated by stars here), while the Likelihood scale has 6 options, with the 6th being "Issue" - if this is an Issue then the 5 stars will turn red. These Impact and Likelihood scores are what provides the RAG rating for the Risk/Issue, as indicated by the coloured triangle below the Ref Code. 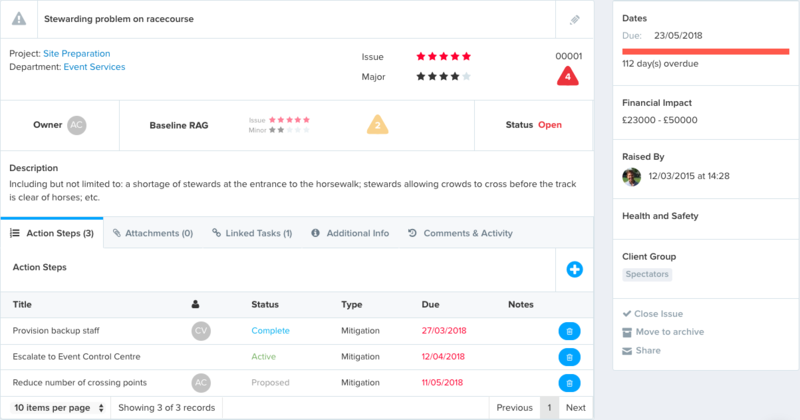 In the next section down are shown details of the Risk/Issue Owner (hover over the bubbles for full user name) on the left and its Status (Draft, Open, Closed) on the right. Between these two are the Risk/Issue's Baseline RAG Status, made up of its original Impact and Likelihood scores (which cannot be changed after the Risk/Issue is first created) and its resultant RAG, with a description for the Risk/Issue below that. The right hand panel gives other details for the Risk/Issue, including Due Date with a bar showing how many days are remaining (this changes colour according to the proximity to Due Date). Below can be seen the Financial Impact possible were this Risk to become an Issue, then the Risk/Issue Raiser, and any Tags that have been selected for the Risk/Issue, in this example the Phases and Enablers that the Risk/Issue affects, if any. Finally are options to Close or Archive the Risk/Issue (if you have permission), or Share it. The next section on the Risk/Issue Details page are the tabs, one for each of Action Steps, Attachments, Linked Tasks, and Comments & Activity. The first tab contains the list of Action Steps to which the Risk/Issue is parent (as indicated by the summary above). You can create new Action Steps by clicking the + button and entering a title, then change additional details by hovering over the field you want to change and clicking the pencil icon. The next tab shows any attachments or documents that have been uploaded to this Risk/Issue, along with a link to upload new files by clicking the + button. Attachments can be downloaded/viewed by anyone with read access, and can be edited or deleted if you have write access. The next tab shows any Tasks to which this Risk/Issue is linked and allows you to add new Task links by clicking the + button and locating the Task in the popup window. Click on a linked Task's name to be taken through to the Task Details page. Any changes to the Risk/Issue will notify linked Task owners. The Additional Info tab allows you to input further information for each Risk/Issue, such as what might be expected if certain Action Steps are achieved or not. This text can be formatted so that you can organise your thoughts and plans more effectively. Finally comes the Comments & Activity tab, which allows you to make update comments on the Risk/Issue and also provides a complete Activity history for it. This is an indelible record for each Risk/Issue of any change made to it from creation onwards.